LUXURY Villa. Private Pool. Walk to Beach.. No car needed. Best location. If you are looking for a serene and romantic tropical hideaway in a luxury renovated cottage, 5 minutes to everything, this is The Secret. This secluded Shangri La is the perfect spot for your proposal, wedding, honeymoon (or both) or your anniversary or birthday. Once you are inside your private compound, behind your big garden gate, you are in your own private place to relax and rejuvenate. * Private bedroom with new air conditioner. Glass 4 ring stovetop and BBQ grill on the patio. Please note that there is no stove. However, if you want a full gas stove, we have another villa next door with a stove so please ask us if you want that before booking! * Large stainless steel refrigerator and dishwasher. Nice furniture. Private views of nature preserve with glimpses of the sea and islands beyond. Stroll down a tropical path to enjoy dinner at our wonderful new restaurant, Pangea, serving an exciting array of international cuisine that is naturally sourced. Our unique Virtual Concierge Service by text and 'phone, gives you local's advice on demand. We specialize in weddings, honeymoons; Anniversaries. Stroll down to Sapphire beach in under 5 minutes. This is now the most happening spot for live music. Local bands play dance music on Sundays. Here you will find good snorkeling and you can often see turtles. We book a selection of boat trips leaving from the Marina. On the other side of you is Smith Beach National Park. Here you will find the island's most serene, quite unspoiled beach: Lindquist. Red Hook, a couple of minutes away, has about 20 restaurants and bars. You also have the ferry terminal .which offers you hourly service to St. John and also to Jost Van Dyke and Tortola in the BVI. if you are coming with family or friends or have a wedding party, we have 2 side by side cottages. If we don't have your dates, please ask us about the other private pool villa. I have lived on an off the island for over 20 years. 30 years experience in hospitality selling some of the best resorts in the world I wanted to create my own guest experiences. I have worked at the Ritz Carlton; Bluebeard's Castle and Hilton Grand Vacation Club. Our emphasis is on personal service according to your preferences. To the best of my knowledge this is the most upgraded cottage at Pavilions & Pools. It is one of only a few with a glimpse of the sea beyond the jungle from our bridge. Updated. Privacy. Perfect romantic retreat. Help with transportation. Your bathroom is a destination resort in itself. Spend time relaxing with a long warm freshwater shower with art glass tiles and original art. Relax on the seat. Glass tiles. Fluffy towels. You won't want to leave. Sapphire Beach and Pelican Beach are 5 minute or so walk. You can also walk to Lindquist Beach in about 15 minutes and take a dollar bus back or a couple of minutes by car which is recommended. Down town could be Red Hook which is half a mile away (5 minutes by bus or taxi) or the historic capital Charlotte Amalie which is 30 mins/6 miles. It has a =Jewlery, danish historic landmarks. 4 minutes stroll to Sapphire and Pelican beach without crossing a road. Pelican Beach, Famous Lindquist Beach is in the National Park next door. A 10 minute walk or a one minute drive. Sea view beyond the jungle. an easy 4 minute stroll to 2 beaches and the marina to take boat trips with our special discounts. Glimpse of the ocean and the island of Tortola beyond the jungle. Glimpse the sea between the trees of our national park. Laundry just down the path You can leave your washing and retire to your compound. Please remember to bring rolls of quarters because we don't have a change machine. Big fluffy ones. Beach towels. Spacious living room with nice furniture overlooking your tropical garden and palm tree with the ocean beyond. Stainless steel dishwasher. Dishwashing liquid provided. Large Stainless steel refrigerator and the only dishwasher in the resort. Electric 4 ring glass hob. No oven. A cook to​p plus an Outdoor BBQ grill. No oven but a glass 4 right burner electric stove top. Grill on the patio. 4 cup drip coffee maker. Filters provided. Little things we think you might need. Please check in cupboard and fridge before shopping. Regular supply of dishes and utensils. Remodeled kitchen. Breakfast bar. Useful kitchen items included. Tropical plants and flowers. 2 beautiful traveller​s palms. YOUR VERY OWN... VERY PRIVATE POOL Romantic and pretty to look at at night. We can arrange for cheapest car rental on island (subject to availability). FREE day pass to nearby SPA featuring gym and 10% DISCOUNT on couples massage. 20% OFF KAYAKING ECO TOURS (your choice). This condo is not part of the 'hotel' run by a third party vendor. Therefore the complimentary Danish pastry breakfast is not included nor 'hotel desk' amenities. However we do not charge a resort fee. No refunds within the 3 months prior to your reservation unless condo can be re rented. Your refund will be less 15% to cover costs. Travel insurance is recommended. This is a great location for a two center eco and ocean vacation: St Thomas AND St John. The location of the cottage is close to the tip of St. Thomas where it almost touches St. John. You can take the 'people ferry' over to Cruz Bay for dinner or to listen to music or, if you have a car , take it across Pillsbury Sound on the 'barge' to explore the National Park for the day. You can walk across to the Sapphire Beach Marina to take the most amazing power boat trip around the BVI and see the famous rock formations at Virgin Gorda' or to take a snorkeling day sail to the St John National Park or a sunset sail around the beaches and islands. 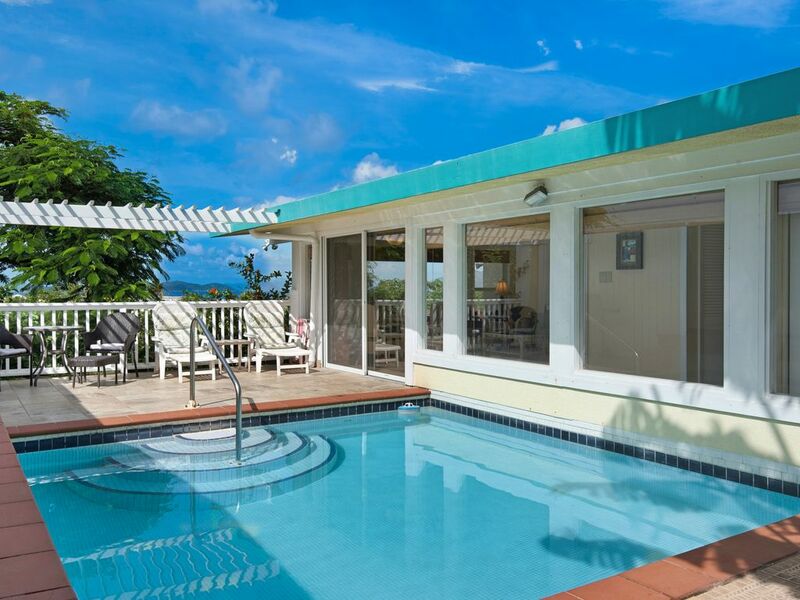 Your view is towards Pelican Beach and Pelican Point across a swathe of protected eastern caribbean jungle that is rich in flora and fauna, with the islands of Tortola and St. John beyond. Although hidden away and surrounded by nature you are only 5 minutes from Red Hook, the centre of dining and night life on the island. Hidden away, no one will know you are there but if you want to go out at night you are close to everything and can have a lot of fun. You are also next door to part of the Saint Thomas National Park. Lindquist Beach (Smith beach) is perhaps the prettiest, most unspoiled beach on the island. You can relax on your beach chair in the shade of a sea grape tree, sipping your drink and put your toes in the clear water. Ah...paradise.